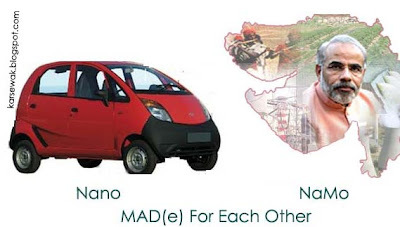 Finally Nano Zoomed into NaMo’s Gujarat, as it was hounded out from Commie State . Thanks Dear Modi for saving India's pride in developing lowest cost car. Every Non partisan Indian would always cheer NaMo for his flair & zeal for development. I believe that development is the only key, i repeat development is only key for 95% of Indian problems. Good wishes to people of Gujarat and Narendra Modi for sending right message to Global Investors that Gujarat is indeed the place for investment. It is a great news on this Dussera/Diwali. We need Industrialists like Ratan Tata and Dynamic leaders like Narendra Modi ,then Industry, Money and Stock Market will follow the right path. As of now all right paths in India lead to Gujarat, as it ruled by the right Man. Nano is gone from Leftists West Bengal , this will prove good for TATA in longer run , with strikes, bandhs , rally almost everyday, except on Durga Pujas , these Leftist’s would not have let them work there in Bengal. For the same reason many Industries have quit Bengal ,its entire Hosiery Industry shifted to one or other state and others who left in recent past are Philips , Bata , Dunlop, Jessop, ICI , Reckitt and Koleman , GSK, and the list is unending. Dogs if standing near Grass , will neither eat it , nor will allow cow to eat it peacefully , by continuous barking . Mamata Banerjee is one such Dog , she tried to outsmart the Communists in their own game . She won the game , but Bengal lost its face. Commies are always known for their autocratic facism , had they used it on Mamata , Nano project cud have been rolling by now with pride in Singur . The fact is that Buddadev never has behaved like a Communist , he should have put Mamata into a Labour camp where she got to clean the toilets used by the Bihari’s. Where is Laloo the joker who said that the train caught on fire by itself?? He has made Bihar from bad to worse. All he is good at is minority appeasement. Same is the case with Congress and leftists. Sorry Kerala, I wish you had a Modi as your leader, you won't have to go to middle east and clean toilets. Sorry Bihar, I wish you had Modi instead of Laloo’s and Paswan’s, you won't have to go to other states to pull a rikshaw. Same goes to WB and other looser Congress/left states. Hail Namo (Narendra Modi) .Genius like him can only change the Nation to a Prosperous one just like Gujarat. After all the hue and cry over riots , Gujarat still is a prospering state. Namo should be the right candidate for the Prime Minister of India, if BJP comes to the power . He's the only leader who can talk tough with all the jokers (read CPI(m)) and brokers(read Congress losers).